I love me some salmon for my din dins! Not only is it the tastiest darn fish on the market, but packs some powerful health punches to boot. Got some fussy fish eaters at your digs?? Convince them to chow down on those Omega 3’s by sticking some nuts to those pink pieces of piscatorial nutrient bombs. They don’t care about the health benefits? Lucky this dish delivers on flavour too, so you’re home and hosed. 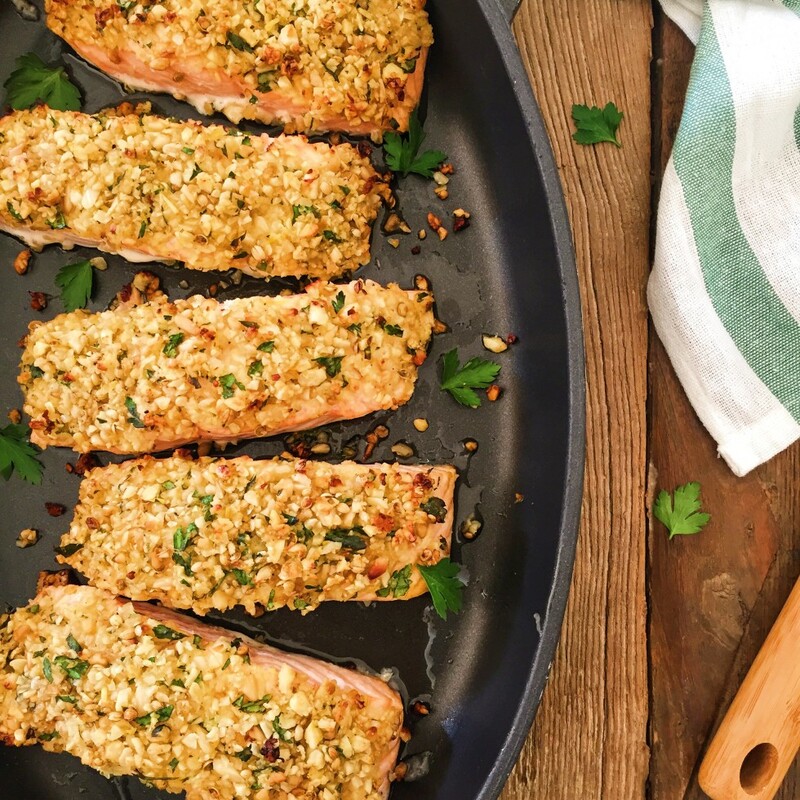 Place the salmon fillets skin side down on a lined baking tray. Spread each piece with a layer of mustard. To make the crust: grind the coriander seeds in a mortar and pestle. Chuck the almonds and pine nuts into a food processor and pulse a few times to a rough crumble. Put the nut crumble in a bowl and mix with the seeds and all the remaining ingredients. Press the mixture evenly on top of each fillet, sticking it to the mustard.